Some good reports of salmon fishing around Sooke this weekend! It sounds like there was solid action in the mornings, with plenty of hits on purple haze squirts and anchovies, and some nice keepers up to 10 pounds. Doug from D&D Fishing Charters says "it was on fire! We departed the dock at 8 and returned at 1230. Landed 8 fish which we released 4 of them and lost three we never saw. We ended the day with a double header which we kept the first fish to the boat (10lb) and released the second fish which was 12 lb+. The fish you see in the photo are most around 27+- inches. The water was flat calm. 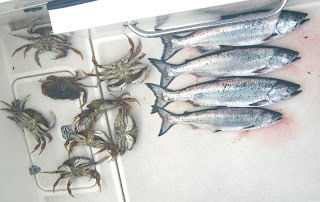 Crabbing was also excellent, dropped two traps when departing and on return had 8 crab to take home." Steve from Seawind Fishing Charters had a similar Sooke report -- fishing in front of the Trailer Park, on Saturday for just a few hours, they caught 12 salmon up to 9 pounds. He said they two biggers ones on that got away, they were ripping out line -- so maybe there's some big ones out there. The fish were caught at 130 depth, with purple haze squirt and blue and silver coyote. Closer to Victoria, Trevor from No Bananas Fishing Charters says "Sat morning we headed out to Constance Bank. Once there we put one rod down with anchovie and one with a puple haze squirt, both rods hitting the sand in 130feet of water. We didn't go more than a minute when both rods started to go. It was very consistant for 3 hours and we kept our 6 salmon, 8-10lbs, and let go many others. Sunday morning we ended up over to Whirl Bay to hide from the north- east winds. We had to work for our fish but managed to keep 4 all around 9 or 10lbs and lost a few more as well. The same gear as above was the ticket again but in shallower around 90ft of water. So I would say there is good fishing to be had and should just get better and bigger in the next couple months." Nice! That's what you like to hear. Still no solid news on the halibut front, as to when the season will open. However, the DFO site now says "Recreational fishing for halibut is closed until Feb. 28, 2011". This sounds like the intended opening is March 1st -- if so, that would be good news. Not the Feb.1st opening of years past, but at least some certainty as when it is time to drop anchor and try for a nice white flat fish! Have fun out there, stay safe.